Residential care home Bisley Woking Surrey. CQC inspected rated Good. We are a family owned residential care home which caters for the needs of 18 elderly residents who have residential or dementia care needs. With just 18 residents, it allows us to give a much more personal service. And it allows them to feel part of the ‘family’ at Elmfield. We have been caring and looking after residents for 25 years. During which time we have seen many changes in both the caring system and Elmfield House itself. However, one thing will never change, our ethos to create a ‘home from home’ environment, where residents feel safe, secure and valued, just as they would in their own home. Independence is promoted and encouraged. It is our policy to involve residents in making as many decisions for themselves as possible. Every resident is provided and cared for with his or her individual needs in mind. We love hearing from our residents families, feedback to us is very important. We recently received the following testimonial from the daughter of a resident. To see many other comments about Elmfield House, please click here for our Testimonials page. Elmfield House residential care home is located in the picturesque village of Bisley based in Woking Surrey. The home is directly opposite the idyllic Bisley Green. In January 2019 the Care Quality Commission (CQC ) awarded us with GOOD rating. This is the second highest award available. A copy of the report is available to view by clicking on the CQC logo above. We also have a copy displayed at Elmfield House. The manager of Elmfield House is Miss Niccii Gillett who has worked within the health and social care setting for over 17 years and has been at Elmfield House for over 7 years. Niccii is registered as a manager with the Care Quality Commission (CQC). She also has a level 5 QCF in health and social care. There is a senior care team who are all trained to level 3 QCF/NVQ in health and social care. 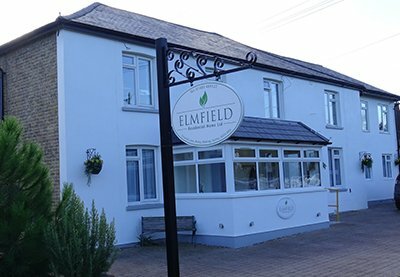 Staff at Elmfield House residential care home are highly trained and complete mandatory training during their induction. There are many training courses available and professional development is highly encouraged within the home. On arrival at Elmfield House residents are allocated a Senior who is a full time member of the day staff team. They will spend time with the resident and help them settle into the home. They will discuss any worries or concerns they might have. Seniors ensure that their allocated residents have sufficient seasonal clothing and toiletries. Individual care plans are constructed by Seniors and are updated monthly to record any changes. An overview of the care plan summary is forwarded to next of kin each month. Visitors are always welcome and can visit anytime, you are also welcome to stay for meals although notice is required. Activities are done within the home on a daily basis and aim to stimulate the residents physically, mentally and emotionally. During the week activities will include quizzes – boards games – ‘ eyes down ‘ for bingo. They can also do arts and craft and the pamper session has proved to be very popular. Chair-based exercises are also done and we have a top of the range power plate to help improve muscle strength and power. We often utilise the services of singers, performers and entertainers. We also take our residents on local outings. Every 2 weeks we visit our local pub the Hen and Chickens for lunch. During the summer residents enjoy tea afternoons on the ‘rec’. The annual Strawberry fayre is very much looked forward to.